Every January I travel south, usually before, but sometimes after the Super Bowl to visit with Walnut Hill alums in Florida. Some years, we travel both coasts, some years we only do one. This was one of those years where the east coast of Florida would outline our travel. 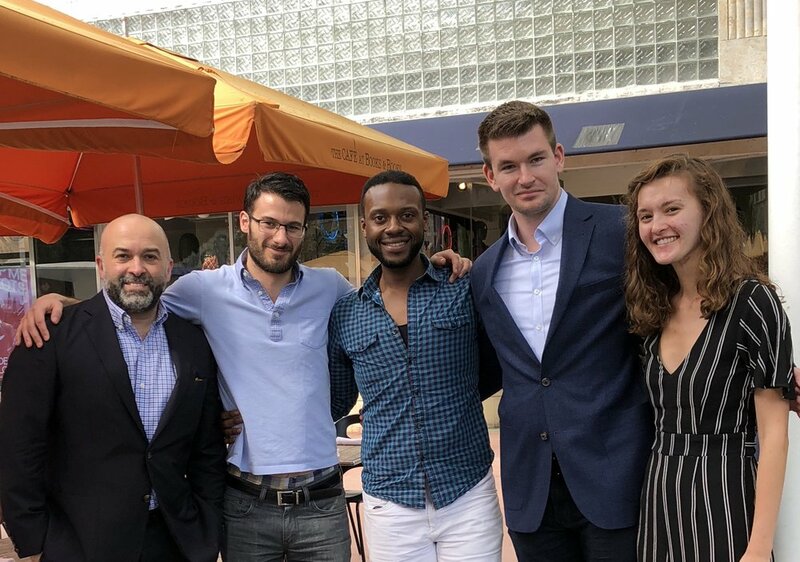 Walnut Hill alums who call the Sunshine State home span widely with recent graduates in the class of 2017, to alums playing as artistic fellows with New World Symphony between 2008 and 2010. Alums like Adam Schnell ‘99 who is the Artistic Director/CEO of Ballet Vero Beach which he founded in 2012 and is the area’s first, and the region’s only, professional ballet company. Or fellow photographer Sarah Cail ‘76 who also resides in Vero. Our trip started in Jacksonville on Sunday evening and took us to Miami by Wednesday. Fortune would have it that Wednesday afternoon was glorious. It was sunny and warm and the energizing vitamin D was very much appreciated. 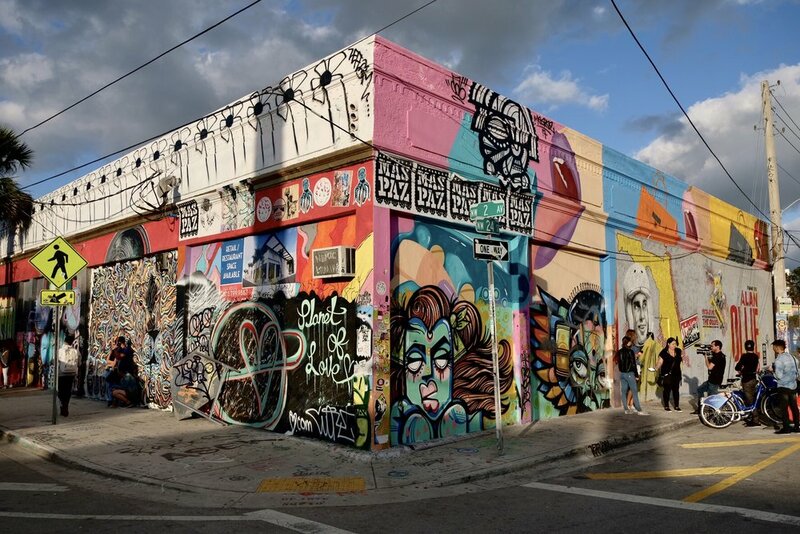 The last visit I made to Miami was in January of 2014 and I had been yearning to visit the Wynood Walls, an outdoor gallery and destination featuring spectacular murals by artists from around the globe. Our own campus mural project led by painting teacher and artist Ken Tighe seeks to find similar inspiration with our visual artists and the walls throughout campus. The Wynood Walls have been on my bucket list for a few years and it was an amazing opportunity to spend several hours taking in the art as the Miami sunshine danced across the garden. The project was the brainchild of late Tony Goldman, a renowned community revitalizer who back in 2009 wanted to transform the surrounding warehouse district of Wynood. His artistic vision was ahead of its time and gave space and respect to graffiti and street art when others in the art world refused to acknowledge the form. He said “By presenting it in a way that has not been done before, I was able to expose the public to something they had only seen peripherally.” Now artists from around the world have displayed their work. The art here is inspiring. It awakens the soul and moves the senses. It inspires us to be in awe of what we humans are capable of. It reminds us that in order to fully know the potential of our creative expression, we must communicate using tools and techniques that free our creative spirit. Under the hands of an artist, what would be an ordinary day on an ordinary wall, becomes a canvas that can express emotion, wonder, and awe. The entire area serves as a backdrop to the real challenges facing communities that have in many ways been forgotten by the rest of us. It also provides a roadmap for how community developers, artists, government, and businesses can work together. Warby Parker has a retail store framed with a mural by artist group Bordall II as part of the 2017 Art Basel Collection. Detroit based Shinola recently opened its flagship Miami store across from Panther Coffee. The coffee is roasted strong and is best appreciated black, no cream or sugar needed. It’s worth a visit and can be a great way to cap off your afternoon. Sit down at the outdoor tables, people watch, soak in the sounds and sights. So good. Thursday morning, our Assistant Director of Alumni Relations, Garrett Murphy ‘08 arranged to have us sit in on a final rehearsal of the New World Symphony latest work. NWS is one of America’s Orchestral Academies and is dedicated to providing artistic and leadership training to 87 young musicians who are granted fellowships for up to three years. In the 29 years since it was founded, New World Symphony has launched the careers of over 1000 alumni worldwide. A number of whom can claim Walnut Hill School for the Arts as their alma mater. This year, three Walnut Hill alums Teddy Wiggins ’08, Greg Cardi ’10, and Margeaux Maloney ’10 are in residence as fellows with NWS. The orchestra was in the final few days of rehearsing a special performance of New Work under the director, co-founder and Aristic Director Michael Tilson Thomas. The New World Center was designed by renowned and celebrated American architect Frank Gehry in collaboration with Michael Tilson Thomas to explore “new possibilities in the way music is taught, presented, and experienced.” More importantly, NWS is fiercely committed to community engagement with programs for students, teachers, families and extended programming for the larger South Florida region. It’s a bold model and one that stands as a strong example to non-profits across the United States. The following day we caught up with Margaeux, Teddy, and Greg for lunch and enjoyed talking about the world of classical music, graduate school and all things Walnut Hill. Two hours flew by and a cappuccino later we had wrapped our five day road trip and headed back to Boston. Miami is a city that has established a strong and vibrant arts epicenter and if you find yourself in Miami take both or either of these arts destinations in. They will feed your soul. Some coffee is meant to be enjoyed with just a small spoon of sugar. For example, when one enjoys a cafecíto at Versailles, the world’s most famous Cuban restaurant. If you go for lunch, share an order of the ceviche tropical and get the Churrasco. Heaven, pure and simple.